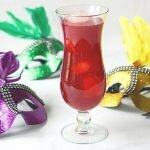 Mardi Gras is just around the corner, so what better way to celebrate than with low carb hurricane gelatin shots! Try this drink even without the rum for a delicious nonalcoholic drink. Add teabags to a large pitch and pour 6 cups of hot water over them. When cooled, add the fruit punch mix and mix well. Refrigerate over night for best taste. Add 1/2 cup of the cold punch in a pyrex measuring cup. Sprinkle in gelatin and whisk until well combined. Heat up 1 cup of the punch in the microwave and then pour over the gelatin. Whisk until the gelatin is dissolved. Pour in the rum and mix again. Then pour into shot glasses and refrigerate for a few hour until set. NOTE: This recipe produces 20 gelatin shots and leaves you will approximately 4 cups of the punch left over. You can make the hurricane drink by pour the punch over ice cubes and mixing in 1 shot of rum.